As Managing Partners, we all struggle with difficult decisions. Often, only minimal information is available, and the stakes are high. To some extent, that’s just the nature of what we do. Hey, if the decisions were easy, they wouldn’t end up on our desk. But there is a way to reduce the risk and lower the uncertainty. How? Through the appropriate use of research to guide our decisions. Now, we’re not talking about the typical consumer research used by packaged goods manufacturers. Many of those methodologies are simply not applicable. Our focus is on research suitable for business-to-business (B2B) situations that are the marketplace for most professional services firms. People have different definitions of B2B research. Broadly speaking, we consider research to be the process of systematically gathering, analyzing and interpreting data. In the B2B context research serves as the foundation for quality decision making. You can collect data specifically to meet your firm’s information needs, which is called primary research. Alternatively, you can take advantage of research collected for a broader audience or another purpose, known as secondary research. Although the research process is sometimes misunderstood and maligned, it can provide the clarity you need to make tough calls. It can also stop you from second-guessing and recycling your decisions. So, here’s what you need to know about B2B research. Why are we so bullish on research? 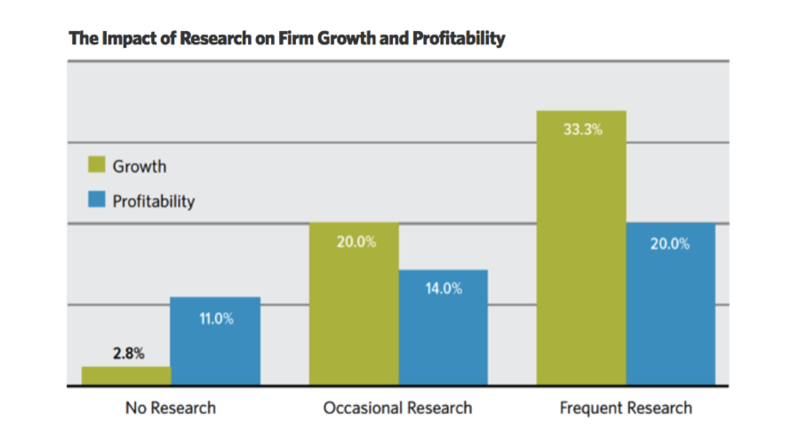 We did research on research and discovered that firms that use it frequently experience higher growth and profits than those that don’t. Firms that conduct research at least once a quarter are nearly twice as profitable and grow almost 12 times as fast as those who fly by the seat of their pants. Bottom line? Research isn’t just fun (yes, we must confess, we love it), but it’s rewarding. To help our clients who are not frequent researchers understand how they were misreading their customers, we conducted a study with over 1,300 buyers and sellers. We wanted to find out what goes on inside buyers’ brains that sellers are missing. What did we discover? Buyers and sellers don’t see eye to eye. Not even close. In fact, a firm may see an attribute as a strength while a client views it as weakness. There’s a reason for this chasm between buyers and sellers. Managing partners tend to forget one critical fact. We’re human. That means, contrary to popular opinion, we’re not entirely rational. Science shows that our emotions drive our perceptions and decision-making. Also, in the absence of perfect knowledge, we make assumptions. We think we know our clients. They, too, make assumptions about us. But, as discussed in Inside The Buyer’s Brain, buyers and sellers often misjudge each other. Here’s just one small example. As experienced professionals, we believe we know which firms compete with us. But when you compare the firms’ lists of competitors versus those compiled by their potential clients, there is typically only an overlap of 20-40%. Now that’s a big gap in perceptions. When you lack solid information about your market, you’re forced to make decisions with blinders on. As a result, you may miss opportunities and waste resources. While it’s important to conduct research for many decisions, it’s especially critical when the stakes are high or emotions are involved. Or both. Research is valuable when you’re determining pricing, budget priorities, or your strategic direction. By determining how your buyers perceive you, a client study can help you rebrand your firm. And learning about your buyers’ needs offers guidance for new service offerings. By enabling you to make sound judgments and align your marketing approach to buyer perceptions and needs, research reduces risks. It provides a competitive edge, empowering you to help potential clients choose you. And that’s why frequent researchers make more money and grow faster than those who rely on gut instincts. It’s often a good idea to start your research by gathering and synthesizing all your firm’s knowledge. Internal research helps identify what your team knows, the assumptions you need to test, and questions you need to answer. But do not rely on one voice or the drumbeat of those who express their opinions the loudest. Instead, survey all associates who are in a position to offer their perceptions of the market. Next step? It’s second nature today. If you have a question, Google it. To gain a better understanding of your market, search online. You may be able to find industry research, either paid or free. Many reports provide the big picture of a market’s size, growth, trends, competition and more. Also, to gain an awareness of your buyers’ concerns, you can listen to their conversations via social media. But the most valuable insights to answer your firm’s specific questions are likely to come from primary research. Because it’s customized to your needs, it’s the most costly approach. So for the most cost-effective approach, and the best quality decisions, you will do best by combining all three approaches to gathering information. It’s understandable that Managing Partners are sometimes tempted to cut corners on expenses by trying to administer research themselves. But doing so is unlikely to yield the most accurate depiction of your buyers. First, your clients may not give you straight answers. Perhaps they don’t want you to know how valuable you are to them. After all, if you knew, you might charge more. Or, maybe they don’t want to hurt your feelings. Second, successful research requires expertise. Professional researchers understand that the structure and sequence of questions can influence the results. Methodologies serve different purposes too. Should you use in-depth interviews, online surveys or focus groups? Here’s a hint. Forget the focus groups. They are expensive, impractical and full of bias. But other methodologies each play a specific role. There you have it. Research, whether basic or advanced, can help reduce risk. It can make important decisions easier to make and easier to “sell” to your fellow partners. With advantages like that, B2B research is a tool you should know about.